Maggie Huculak, Lisa Karen Cox, Norah Sadava and Cheyenne Scott in Now You See Her. 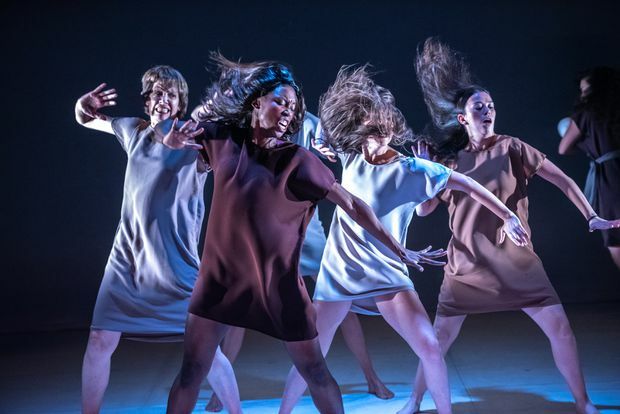 Now You See Her is the sophomore effort by the collective – and, for it, co-artistic directors Amy Nostbakken and Norah Sadava have been joined by four other female performer/creators to tackle the subject: All the ways in which women disappear in plain sight in our society. A couple of years ago, Quote UnQuote Collective made the most impactful first impression of any new Toronto theatre company in at least a decade with a show called Mouthpiece. That two-hander about a woman struggling to find the right words to eulogize her mother, and the politics of women’s voices, earned the company famous fans (such as Jodie Foster), was swiftly made into a movie (which premiered at the Toronto International Film Festival in September) and continues to tour internationally (Halifax later this year, before four stops in California). Among the characters we meet are a white scientist in her 30s (the always entertaining Nostbakken) whose colleagues talk over and around her at cocktail parties and conferences – and whose cheery acceptance of that slowly chips away; a black pop star (a scene-stealing Lisa Karen Cox) whose real identity is erased by her fame – and online gossip sites that essentially publish celebrity fan fiction; and a young Indigenous woman (a sweet, softer-spoken Cheyenne Scott) headed to UBC for environmental studies who fears becoming another of the missing and murdered. Cyrus Faird, Farid Yazdani, John Chou, Sugith Varughese and Gugun Deep Singh in The Men in White. While Mouthpiece had a cohesive style and two physical-theatre performers perfectly in sync, Now You See Her embraces diversity in aesthetic, not just in its cast. As the play cycles through spring, summer, fall and winter, each character gets the chance do their own thing once a season to varying effect. Raha Javanfar’s scenes are spoken-word speeches that bring the politics of the piece to the surface, while the veteran actor Maggie Huculak exploits the subtext in a series of searing, sardonic monologues as a 64-year-old journalist up for a lifetime-achievement award. Meanwhile, as a mother with a young baby, Sadava performs a poignant clown routine in counterpoint – never really able to get through a full scene because of her baby’s cries. These individual pieces of the show overlap and interrupt – with only Orian Michaeli’s emotive choreography and Nostbakken’s cool musical compositions to bring the collective together as a collective. 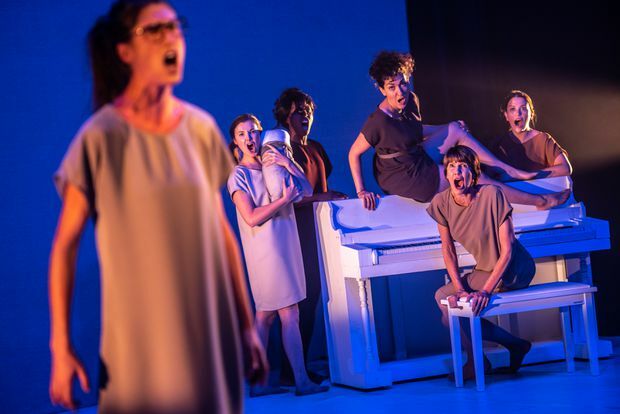 Now You See Her, which is co-produced with Why Not Theatre and Nightwood at Buddies in Bad Times, does have a very satisfying framing device that amounts to a feminist middle finger raised at the prog-rock band Pink Floyd – for very good reasons I was previously ignorant of. I don’t want to spoil the effect by saying anything more. Chanakya Mukherjee and Tahirih Vejdani in The Men in White. On the same night Now You See Her opened, The Men in White – with a cast of seven men and one woman – did as well, across town at the Factory Theatre, a kind of accidental gender parity in actors between the two stages. Anosh Irani’s play – which premiered at the Arts Club in Vancouver in 2017, was recently published by Anansi and is currently up for the Governor-General’s Award for Drama – tracks two brothers in two time zones. Hasan (Chanakya Mukherjee), in his late teens, lives and works as a chicken cutter in a shop in a Muslim quarter of Mumbai; Abdul (Gugun Deep Singh), in his 30s, works and lives in the back of an Indian restaurant in Vancouver. Cricket is an escape for both of them from lives that are less than they’d hoped for: Hasan bowls and bats mostly in his mind, which always is wandering away from the chickens at hand, while Abdul’s only relief from his under-the-table job in an overpriced city is getting out on the pitch on the weekend. The Men in White alternates between scenes that depict Hasan’s life as a chicken cutter working for father figure Baba and flirting, badly, with the girl and aspiring medical student next door, Haseena. 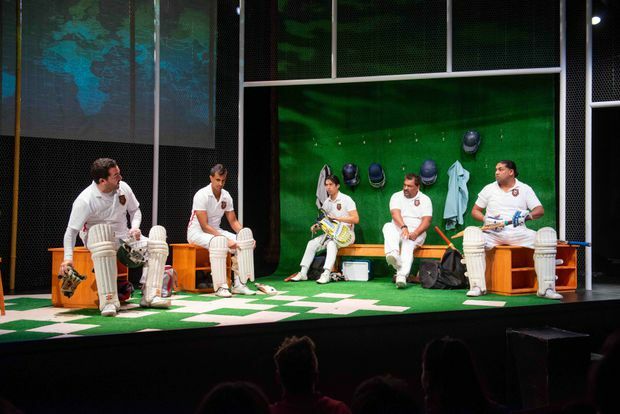 The Men in White alternates between scenes that depict Hasan’s life as a chicken cutter working for father figure Baba (Huse Madhavji) and flirting, badly, with the girl and aspiring medical student next door, Haseena (Tahirih Vejdani); and Abdul hanging out with his fellow batsmen and bowlers in the locker room at their cricket club. There is hope that these two worlds will eventually collide. Abdul’s cricket captain, Randy (a wonderful Sugith Varughese), has hatched a plan to bring Hasan over as a ringer for a season, a plan opposed by a player known as Doc (Cyrus Faird), who is not fond of Muslims, “illegal” immigrants and especially those who are both like Abdul. 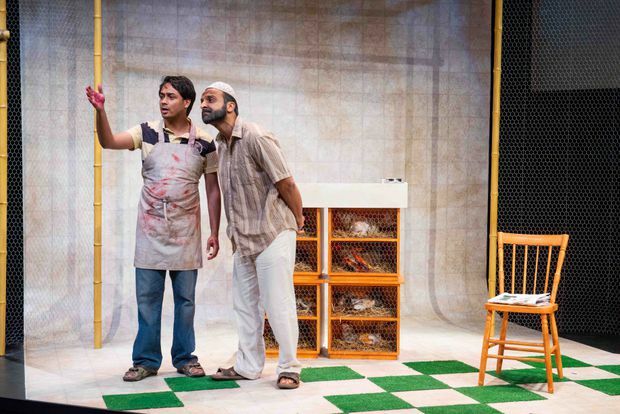 In director Philip Akin’s production, which I saw in its final preview, The Men in White mostly came to life in the lively locker-room monologues about the players' different experiences of (non-)integration into Canadian society as South Asian immigrants. Both Singh and Varughese are stand-outs at opposite ends of the economic spectrum. But the comic locker-room banter in between, and there’s a lot of it, is unconvincing, while the rom-com in Mumbai moves at a sluggish pace. 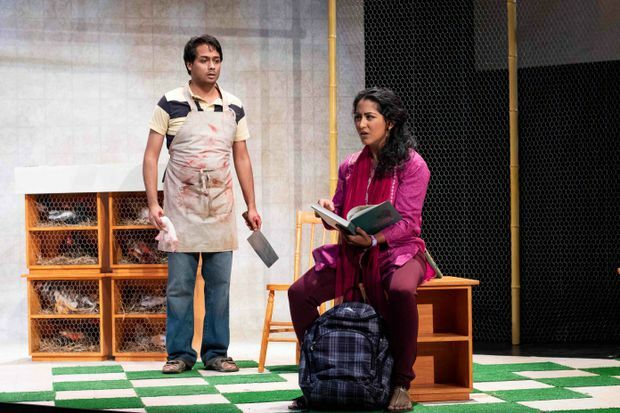 Ultimately, the play’s split-screen structure, its disconnection by design, is an intriguing idea on the page, but is simply unsatisfying on the stage. Now You See Her (buddiesinbadtimes.com) and The Men in White (factorytheatre.ca) both run through Nov. 4.